A survey conducted in early May after the Senate rejected a measure to expand background checks on private gun sales found that gun rights advocates continue to show a higher level of political activism on the issue than those who favor stricter gun control measures. 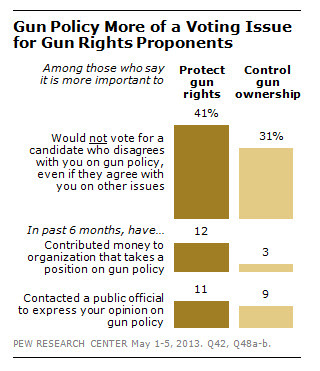 Among those who prioritize gun rights, 41% say they would not vote for a candidate with whom they disagreed on gun policy, even if they agreed with the candidate on most other issues. That figure is 10 percentage points higher than the number of gun control supporters (31%) who say gun policy is a make-or-break voting issue for them. And while nearly as many gun control supporters as gun rights supporters report contacting a public official about gun policy in the past six months, more gun rights advocates have contributed money to organizations that take positions on gun policy (12% vs. 3% of gun control supporters).